Description: CT-C series hot a ir circulation oven adopts noise elimination and thermal stable axial flow fan and automatic temperature control system. 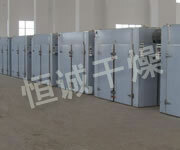 The entire circulation system is enclosed to make that the heat efficiency of the drying oven increases from 3~7% of the traditional drying oven to 35~45% of the present one. The highest heat efciency can be up to 50%. CT-C series hot a ir circulation oven adopts noise elimination and thermal stable axial flow fan and automatic temperature control system. 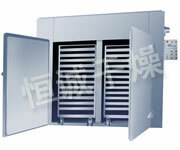 The entire circulation system is enclosed to make that the heat efficiency of the drying oven increases from 3~7% of the traditional drying oven to 35~45% of the present one. The highest heat efciency can be up to 50%. The successful design of CT -C hot air circulation oven makes that the hot air circulation drying oven in our country reach the advanced level in the world. It saves energy and increases the economic benet. In1990,the medical management bureau of the State issued the industry standard and the uniform type is RXH. 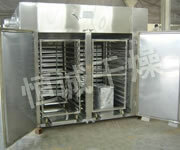 ◎The size of drying tray: 460 ×640×45(mm). Most hot air is circulated in the oven. The Heat ef ciency is high and the energy is saved. By using the forced ventilation function, there are adjustable air distribution plates inside the oven. The materials can be dried uniformly . The heating source might be steam, hot water , electricity and far infrared. With a wide selection. The whole machine is low in the noise. The operation is in balance. The temperature is controlled automaticall y. The installation and maintenance are easy . The application is wide. The machine can be used for drying various materials and is a versatile drying equipment. This drying oven is suitable for the material and product hot solidication and dry de-watering in the pharmaceutical, chemical, food, farming, side-product,aquatic product, light industries, heavy industries and others industries. Such as:raw material medicine, crude drug, prepared herbal medicine of Chinese traditional medicine, plaster , powder, particle, drinking agent, pill, packing bottle,pigment, dyestuf f, de-watering vegetable, dried fruit piece, sausage, plastics,resin, electric component, baking varnish and etc.